Save the screenshot in a directory if the test is positive, in another one otherwise. This gave me 9450 hosts to test. I used the provided tools with minor modifications to make it work on my usual test machine and was good to go. The full scan took several hours to complete and gathered about 500 MBytes worth of screenshots. 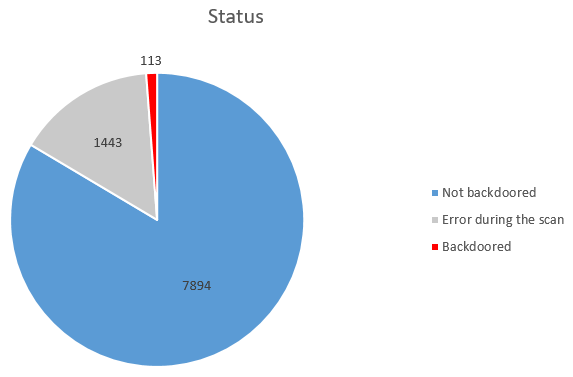 The high error count is mostly due to the fact that lots of the IPs with the RDP port being open were residential connections with a DHCP assigned public IP. The data from shodan being not real-time accurate makes it probable that many IPs were reassigned before our tests. It also means that more backdoored systems could be found in this gray area. All the vulnerable IPs were promptly reported either to Swisscom through their bug bounty / responsible disclosure program or to MELANI for all the IP’s that do not belong to Swisscom’s network ranges. Swisscom immediately forwarded the information to whomever was impacted and awarded a CHF 500 bounty since two of the backdoored servers were in the scope for the bug bounty.